We saw this outfit on the Moda Operandi website and thought it was chic. 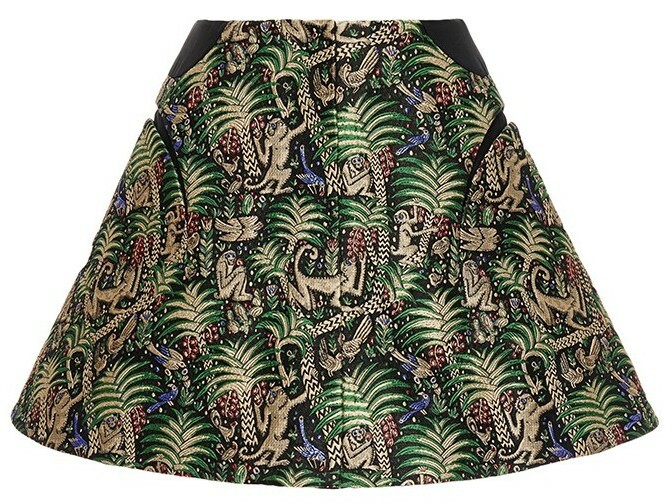 It pairs an ornate Delpozo black organza with a Delpozo green jungle print jacquard mini skirt. This top is simply gorgeous. We love the stylish ornate design. Very glamorous. Unfortunately, with a price tag of $2,100, this top is out of our budget at the moment. From Moda Operandi – The beloved Madrid-based label, DELPOZO, incorporates couture techniques into their modern designs, creating uniquely feminine pieces with a timeless elegance and a fresh spirit. 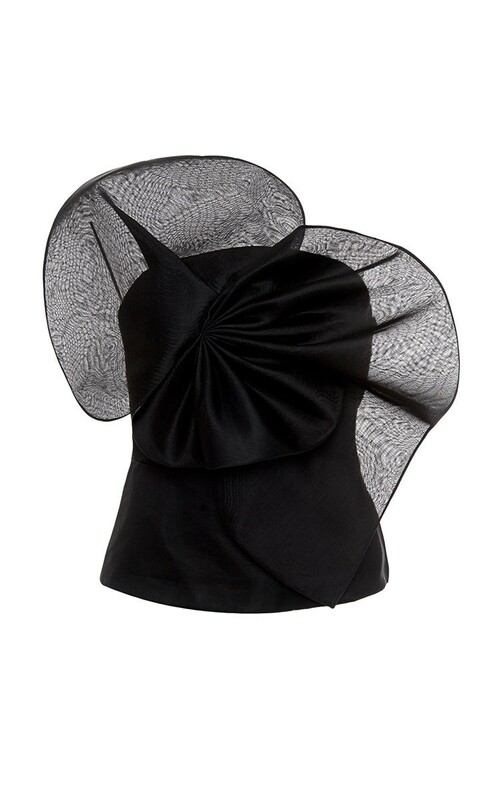 The epitome of romance, this black organza top delivers just the right amount of drama with curved lines and asymmetrical dimension. This top is a 100% silk top. 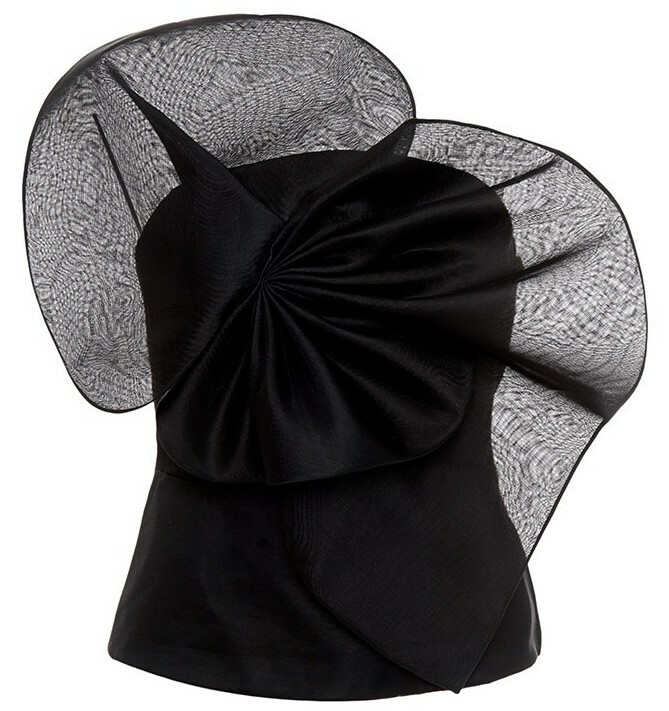 Moda Operandi paired the Delpozo black organza top with another piece from Delpozo. 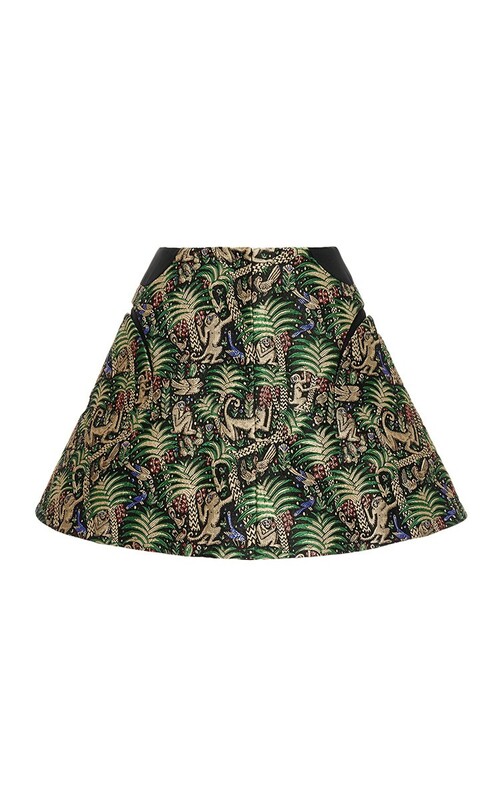 A cute little jacquard skirt with a flared style. This skirt is made of 76% polyester, 7% cotton, 7% acrylic, 6% silk, 3% polyamide. We think this skirt is an excellent choice to go with the black organza top. We’d love to try this outfit ourselves but with the top costing $2,100 and the skirt costing $2,350, we’ll have to come up with an alternative look. From Moda Operandi – A regal jacquard pattern shines on a girlish silhouette—the perfect combination of sophisticated and playful. The black patent sandals and the red clutch that the Moda Operandi stylists selected for this outfit are excellent choices. But for our personal taste, if we were styling this look, we might go with a black clutch purse with gold hardware instead of a red clutch. We do like the red. It makes the look pop and adds excitement and fun. But for us, we’d go with the Jimmy Choo Alara suede clutch or the black patent Belle Vivier leather clutch from Roger Vivier. Or maybe a black patent lether Jimmy Choo Maia clutch or an Alexander McQueen black Satin clutch.